Veteran Better Half Dash driver Kristen Yeley clocked the fastest time in Monday's qualifying session and will be among the favorites to win the fourth annual Better Half Dash when the ladies of NASCAR return to Charlotte Motor Speedway's frontstretch quarter-mile during Bojangles' Pole Night on Thursday. Yeley, wife of NASCAR driver J.J. Yeley, said she is happy with her qualifying effort, a 19.864 second lap, but also aware of how much different the racing will be under more crowded race conditions. "Three years of experience," she said. "I'm a lot more comfortable. I need to find my groove a little bit It takes me to find my groove, but when I do, I'm completely comfortable and I know my limits." Melanie Self, Heidi Stoddard, Ashton Bayne and Karlee Hensley rounded out the top five, while Ashley Deihl Stremme, Ashley Allgaier, Jenna Robinson, Adriene Pattie and Jordan Fish finished 6-10. Amy Reimann did not qualify. Despite running the only sub 20-second lap, Yeley won't know until Thursday if she'll be sitting on the pole when the 25-lap charity race supporting Motor Racing Outreach and Speedway Children's Charities goes green. That honor will be determined by fan donations. 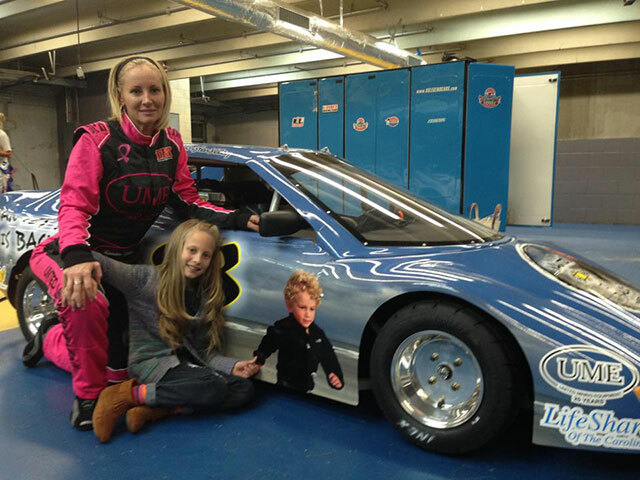 Fans can make a donation to keep Kristen on the pole at www.betterhalfdash.com. The driver with the most individual donations will have the option of choosing her starting spot. Yeley is racing for Yantz's Sun is Back Foundation, in honor of a close family member, Yantz Shirey, who lost his life earlier this year.